We are renowned firm of market for presenting the best quality assortment of Stylish Diary, which is enormously well-liked by customers due to string biding and tear resistance. 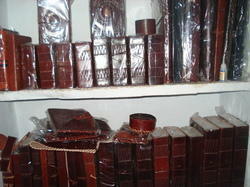 We are offering Gemstone Diary with Pen to our clients. Purple cover bounded through golden rod, these paper diaries are made to frame the distinct dignity. Paper Mache String Diary: Manufactured by Handicapped Persons. 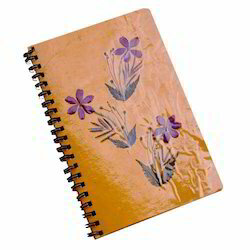 To meet the vast requirements of the customers, we are highly involved in offering Multi Color Diary. These Multi Color Diaries are available in a wide assortment of colors that light up the mood of the person using it. These Multi Color Diaries are so beautifully designed that it can be used for gifting purpose. Fine Leather Diary with nice design work. leather diary available in each sizes.